Tank stands provide stability to a tank when the tank installed is located more than 12" off the ground. It is a steel cradle support system provided when typical installation is not possible. 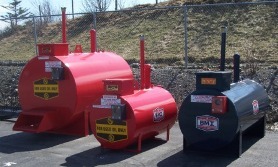 Tank stands can be used for any type tank from domestic oil tank up to the larger double wall tanks.